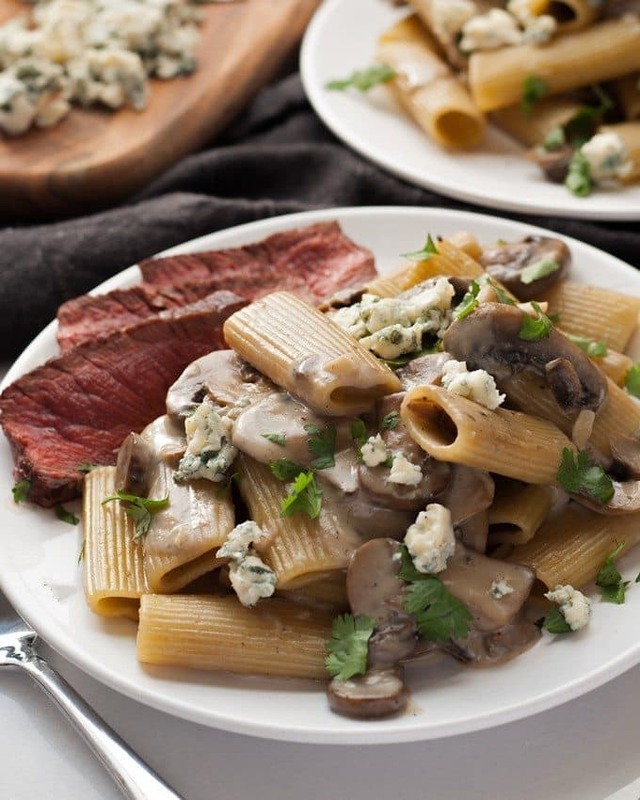 Mushroom blue cheese rigatoni – an easy 30-minute one pot pasta dinner! Perfect for Sunday dinner when paired with steak, or for Meatless Monday when on its own. It doesn’t take a lot to make me happy, except when it comes to taking photos of food for my blog. I have never struggled as much as I have the last 4 weeks. One recipe I posted at night. I took a look at the photos the next morning and ran out to the store to remake it and photograph it again. 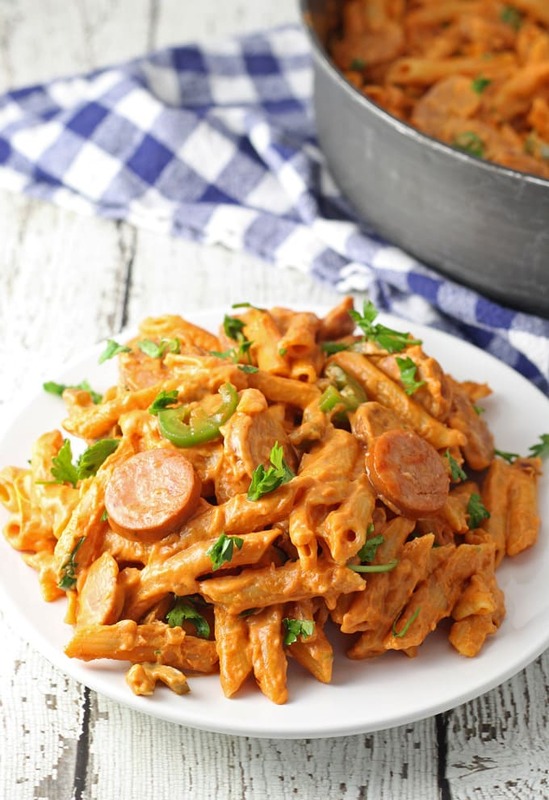 This one pot spicy sausage skillet? I thought it was ready to go and right before I hit publish, I decided I hated the photos. Another trip to the grocery store; another photo session. 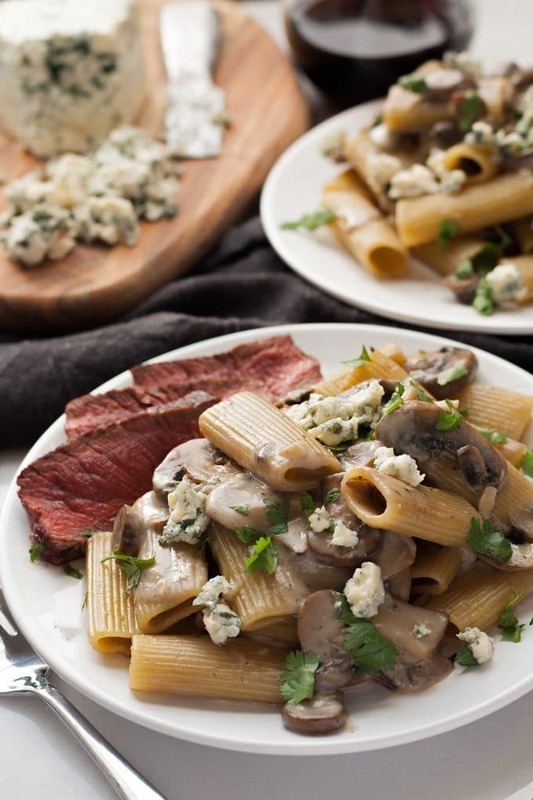 This mushroom blue cheese rigatoni has been photographed 3 times in 7 days. Third times a charm is the saying, right? If you have been following my blog for any length of time, you have surely seen the growth I’ve had with my photography. Taking photos for this blog brings me a lot of joy but I also struggle with it more than anything. I have been watching online classes, reading books and how-to guides and practicing. Practicing a lot. I have been taking more photos with my camera, and my iPhone, which I struggle with even more. People, this blog is definitely a labor of love. And as much as I would love to practice the photos for this recipe some more, I think I got it right this time. 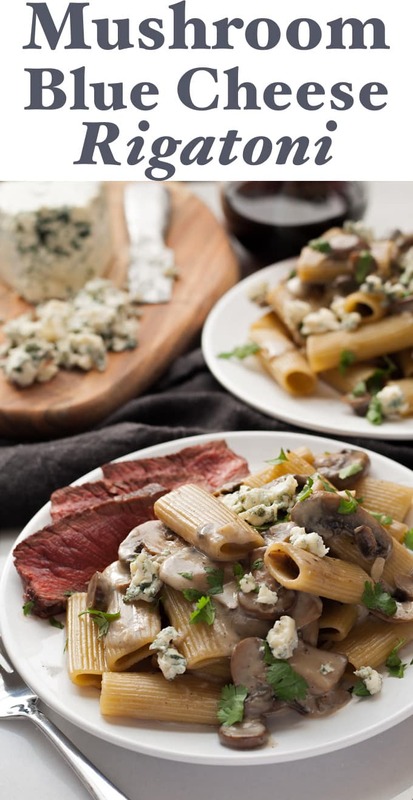 This mushroom blue cheese rigatoni became Mr. B’s new favorite the first time I tested it. He loves mushrooms and blue cheese so it just made sense to pair them, right? Several tests and photographs later, we decided to serve this easy pasta dish with steak. Yeah, you read that right – the steak is on the side! This makes 4 servings so if you make one steak and split it 4 ways, it works out perfectly. I think it is perfect on its own – Meatless Monday, meet your new friend. Mr. B. on the other hand said it needs meat. 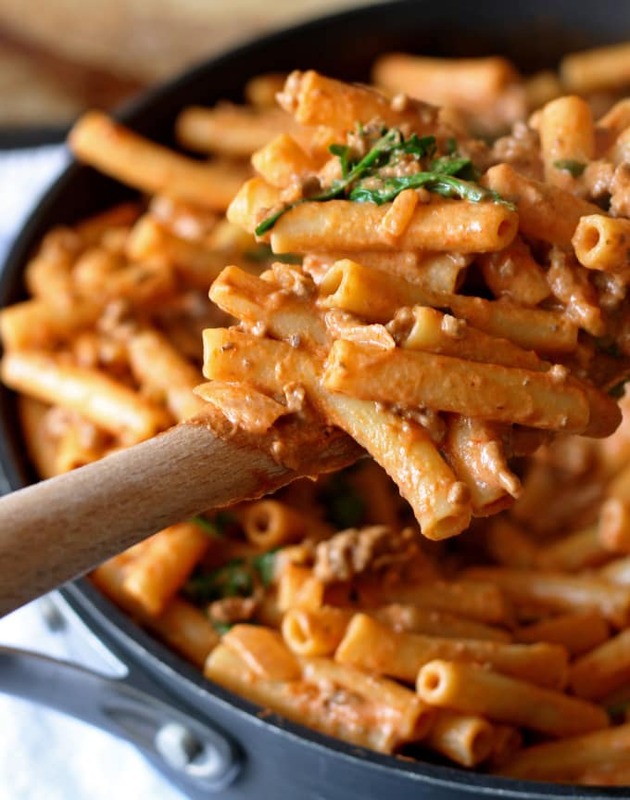 Without the steak, this is another delicious one pot pasta dish and can be made in about 30 minutes. You know I like my easy recipes. I used 1/2 white mushrooms and 1/2 baby portabella. You can do the same or you can go all out with either one. Also, if you change the pasta variety to anything other than rigatoni, you may need to decrease the amount of chicken stock. Rigatoni takes longer to cook so I always include a little more liquid. 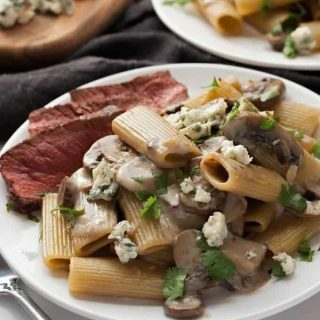 Mushroom blue cheese rigatoni - an easy 30-minute one pot pasta dinner! 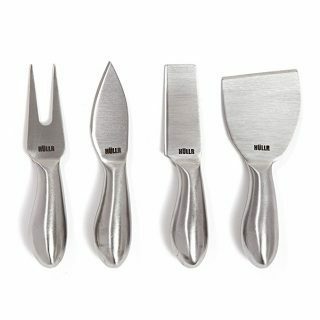 Perfect for Sunday dinner when paired with steak, or for Meatless Monday when on it's own. 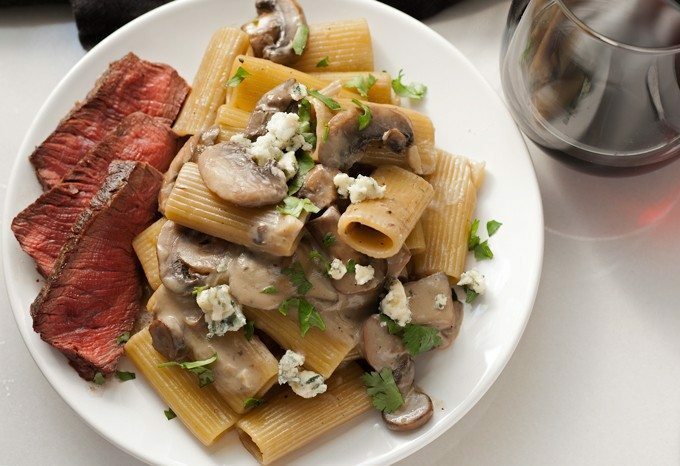 Combine the rigatoni, mushrooms, chicken stock and garlic in a large pan. 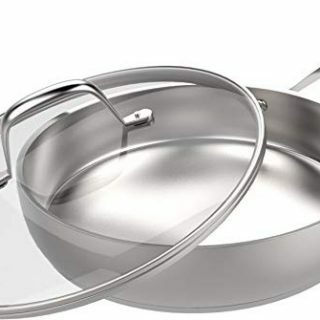 Heat over medium-high, stirring frequently. When liquid begins to boil, reduce heat to medium. After 10 minutes, stir in the blue cheese crumbles. Cook for an additional 10 minutes or until the pasta is cooked and the liquid has reduced. Remove from heat and let sit for 5 minutes to allow the sauce to thicken. Season to taste with salt and pepper. Garnish with additional blue cheese crumbles when serving. Looking for more 30-minute dinner recipes? Try my spicy sausage skillet recipe. Your photos are beautiful! Don’t fret! I honestly struggle the most with photographing pasta. It never looks right. But this pasta sure does!! My mother-in-law is a blue cheese lover and it would pair nicely (aka hide the taste) with her gluten-free pasta. Thanks Kacey! And I agree about gluten-free pasta – I dabbled with it and the flavor/texture wasn’t my favorite but blue cheese definitely would help with that. Looks fantastic! What a great recipe! Well, the good news is your third set of pictures came out really beautiful! 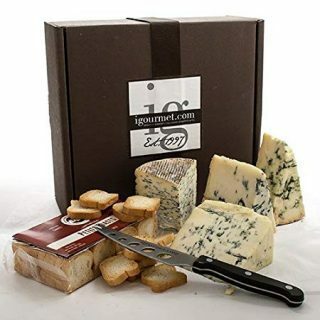 I’m newly addicted to blue cheese (I never used to like it!) and this sounds absolutely delicious! What a nice combo for this italian dish! I would love to make this sometime. Wow this looks fantastic! Yummed & Pinned to our MM Pinterest Board! Thanks for linking up to Merry Monday!Have a great week! My husband will be one happy man when I make this for him. He LOVEs blue cheese and mushroom- anything! I hope he likes it as much as my husband! Your photos are FAB!! Truly beautiful. I’m envious!! And this dish looks to die for. And then I saw the words, “one pot” and my soul sang praises of joy!! Thank you Senika!! Lol glad I could make your soul sing! 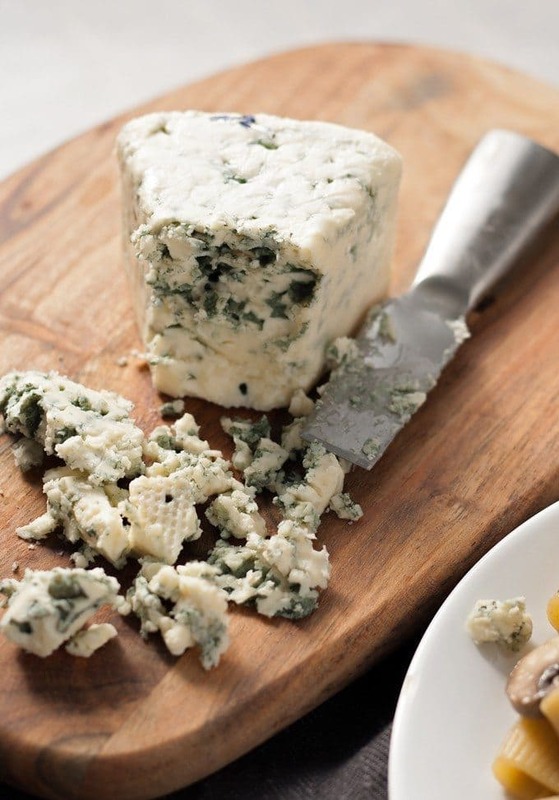 I’ve got a gorgeous brick of blue cheese in the fridge that has to be used – this looks like just the ticket! Oh yes please, blue cheese all the way and mixed with pasta even better! This would be a great meal for a dinner party – looks fancy and elegant but is simple and who doesn’t love pasta! This looks like the perfect stay at home date night meal. Thanks for sharing! I love mushrooms so much. They’re so meaty I agree they can completely substitute for meat and you don’t miss a thing. However, they are also so good WITH meat. Love this dish. Thanks for linking up at #SaucySaturdays. This looks really good. I love having alternatives to red sauce. Pinned & shared. Thanks for joining the party. Have a great weekend. Hope to see you again soon. This looks SO mouthwatering!! YUM!! OMG love the idea of adding blue cheese to pasta! Sure beats the traditional boring red sauce. Yum!